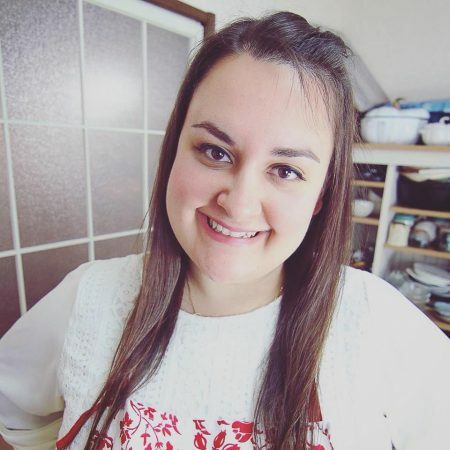 A few days ago I uploaded a recipe for my keto chocolate mousse which is completely dairy free and sugar free. I decided to make that recipe again to make this no bake chocolate tart. I actually made this raspberry chocolate tart a couple of times; once with Lily’s chocolate chips and once with unsweetened baking chocolate. I decided to stick to a dairy free chocolate mousse because it was much lower in carbs and calories by switching to baking chocolate and keeping it dairy free. What I love about this dairy free chocolate mousse is that you can literally use any type of milk you want. 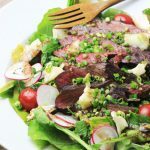 Whether it’s coconut milk like this recipe uses, or almond milk, cashew milk or any other non-dairy milk, it will work. You can eat the mousse as is like I did in my original recipe, or you can serve it inside a tart crust like this recipe. You could also pour it over a sugar free cheesecake after it’s been baked and cool it in the fridge to make a chocolate mousse cheesecake! 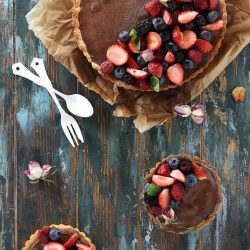 I decided to use my almond flour pie crust to make this chocolate mousse tart and it tasted absolutely amazing! For the crust you have the option to use a version that uses butter or a version that uses shortening. 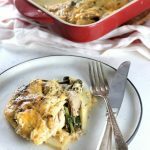 I used shortening for this recipe to keep the entire recipe dairy free. 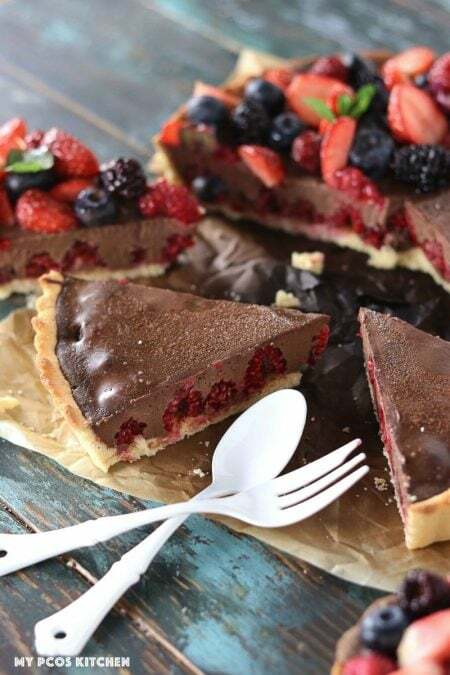 This chocolate mousse tart is very rich and creamy so it goes extremely well when filled with raspberries. 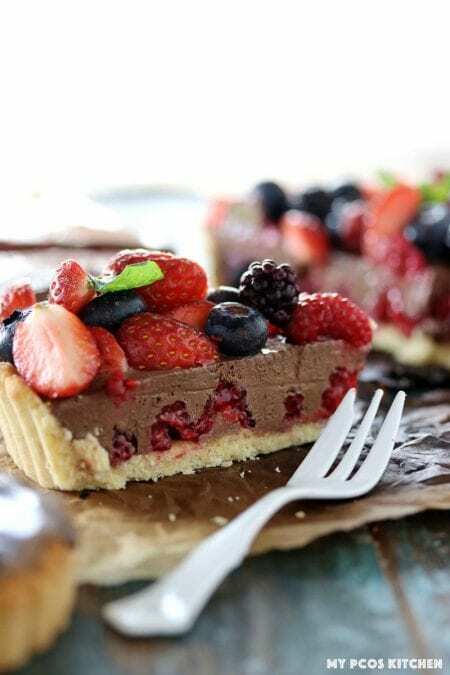 If you would want to eat a plain chocolate mousse tart, you wouldn’t even need to add the raspberries as just the tart itself is fabulous! For the dairy free chocolate mousse, you NEED to use both stevia and erythritol. You cannot omit one or sub one for another. The sweetness will NOT be enough as we’re using bitter unsweetened chocolate. If you were to use already sweetened chocolate, using only one sweetener would suffice, but not for this no bake chocolate tart recipe. 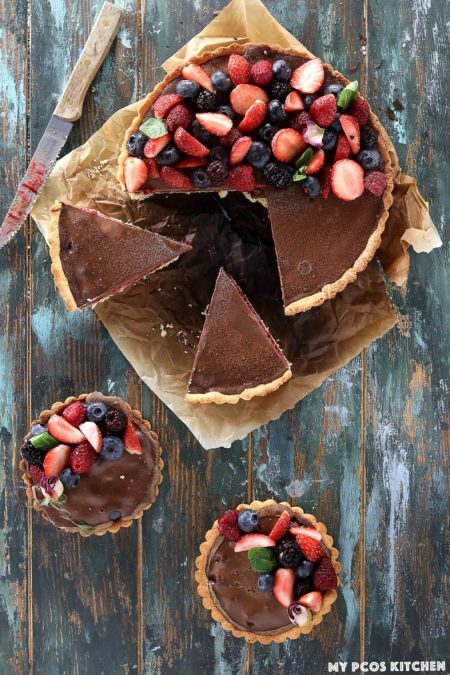 This no bake chocolate tart is super simple to make and doesn’t take too much time to make. The hardest part will be waiting for it to cool down, but it’s totally worth it! I brought it to work the next day because there was way too much for me to eat alone and just sliced the two tarts into 24 slices so that more people could enjoy it. You can use any type of pie or tart mold that you own. I used two 8” tart molds for this no bake chocolate tart. You can also use 6 mini tart molds if you have any on hand. 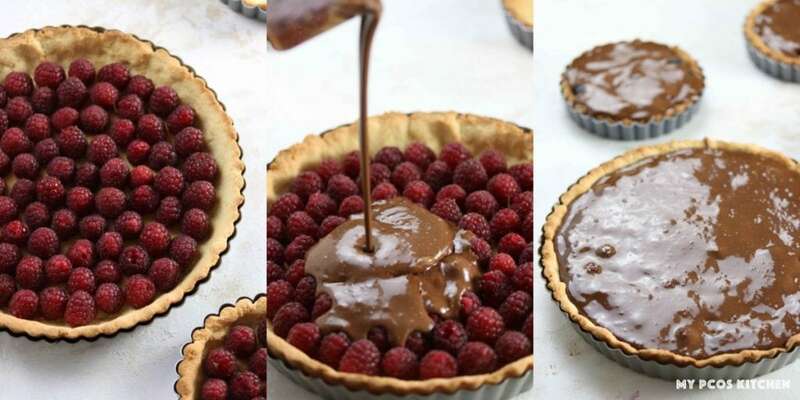 Once you have baked your tart crust, you’ll want to let it cool completely before making the raspberry chocolate tart. For the dairy free chocolate mousse, you’ll want to heat up your coconut milk in a small pot, just until bubbly. 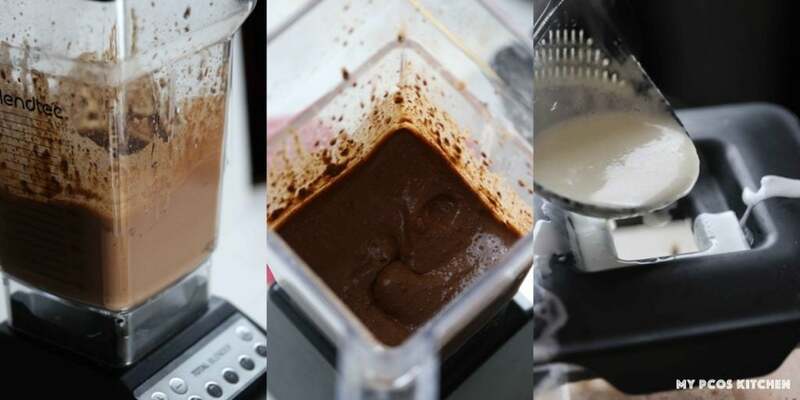 In the meantime, you’ll add the cocoa powder, baking chocolate, erythritol, stevia into a blender and pulverize into a fine powder. You’ll then add the eggs into the blender and process a minute until nice and creamy. The last step is to pour in the hot milk in a slow stream into the blender, while it’s running. This will cook the eggs and make the mousse. You’ll then add your fresh raspberries, but you could also use frozen raspberries if you don’t have any fresh ones on hand, and place them all in your baked tart crusts. 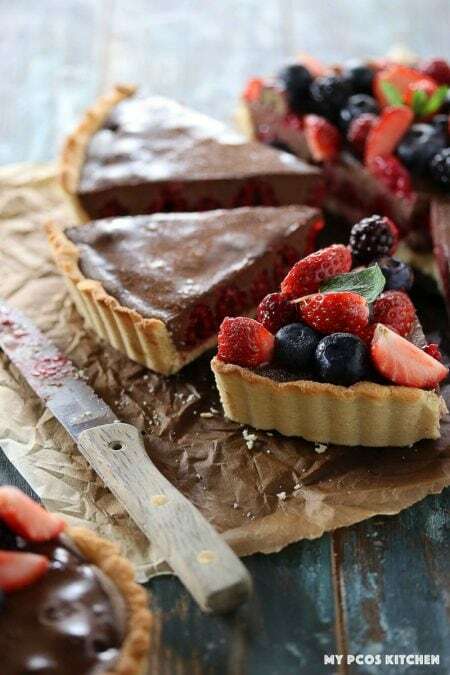 I actually ran out of raspberries near the end so I just used some blueberries, but any type of berry could work for this raspberry chocolate tart recipe. Whatever you think will taste good with chocolate is guaranteed to taste amazing. 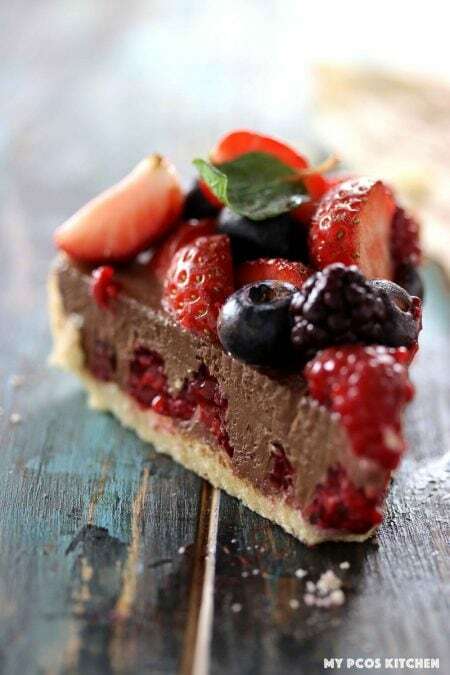 You’ll then slowly pour the dairy free chocolate mousse into the tart crust over the raspberries and place the raspberry chocolate tart into the fridge to cool down. Once it’s cooled, you can serve with some whipped cream, fresh berries or just as is. 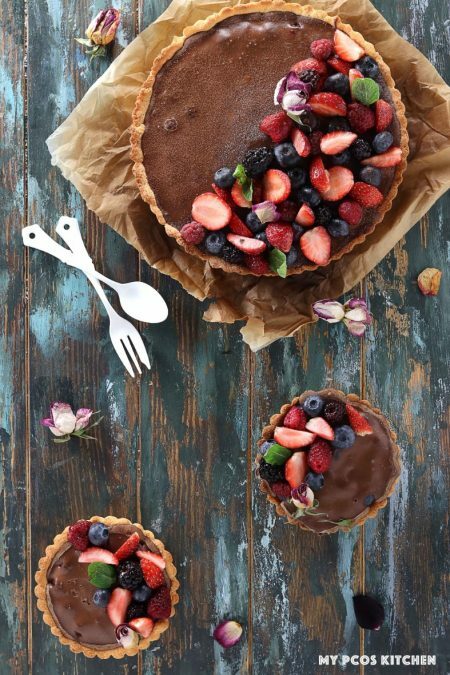 A decadent dairy free and sugar free raspberry chocolate tart. 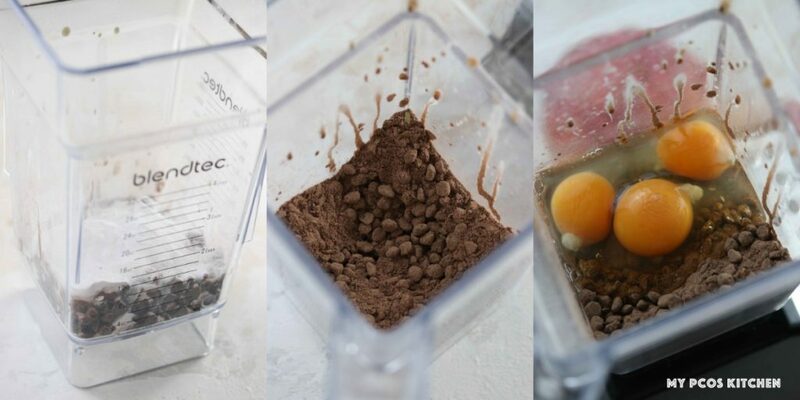 Add all of the ingredients into a food processor and pulse until perfectly combined and a ball is formed. You can also mix everything with your hands and knead until fully combined. Now, you can make two 8 inch pies with this dough, or 6 small pies. In the pictures, I made one 8 inch tart and three 5 inch tarts. Press the dough with your hands into a mold of your choice, preferably one with a loose bottom so that you can easily take it out of its mold later. Make sure the dough is distributed evenly everywhere. With a fork, gently stab the dough in different places to create small air pockets. Take out of the oven and let cool completely before pouring the chocolate mousse inside. Take the small opening off the lid, and while the blender is running, pour the hot milk inside in a slow and steady stream. Don't stop the blender and pour all of the milk in. Let it continue running for another 30 seconds after you've finished adding the cream and that's it. The hot milk will cook the eggs so you do not have to worry about eating raw eggs. Please do not cook it in the oven. Your chocolate mousse will resemble chocolate liquid. Place all of the raspberries inside the tart crusts. Carefully pour in the chocolate mousse over the raspberries until they are completely covered. 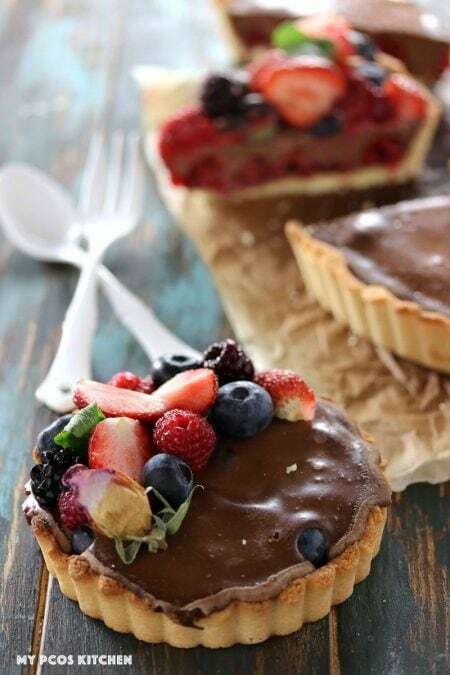 Transfer the tarts into the fridge and let cool 2 hours before slicing or serving! You don’t say to bake it at all. Even after putting in raw eggs? Hi Kathleen, you’re not supposed to bake it. Now I don’t know if your tart will come out alright. Adding the hot cream to the blender cooks the eggs. I talk about it in the blog post. Yep! The recipe makes either 6 small pies, or 2 big (8inch pies) or 1 8inch and 3 small pies. I only have liquid stevia. Would one drop be enough do you think? I would just taste test with your finger until you have enough sweetness to your liking. Hi! Any idea if a food processor would work to make the chocolate mousse/pudding portion of this recipe? I don’t have a blender with an opening to add the milk while it’s running. But I have a food processor. When you use Coconut milk are you using from the boxed/bottled or from a can? 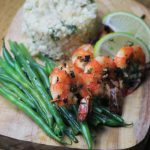 Hi Bettie, I used the Thai Kitchen coconut milk, but any sort of coconut milk will work for this recipe.